In the over­all story of the vast Newton Chambers empire, to men­tion only the firm’s Izal products would just be scratch­ing the sur­face — which the company’s toilet paper did, lit­er­ally. But to get to the bottom of local his­tor­ian Joan Jones’s fas­cin­at­ing present­a­tion about the his­tory of the Chapeltown con­glom­er­ate, the main focus was indeed on the Izal products, from dis­in­fect­ant to coal tar soap, which became house­hold names for most of the 20th cen­tury. And yet the Izal brand of no fewer than 137 dif­fer­ent products, used in hos­pit­als and homes through­out the world in their heyday, was in real­ity just a by-product of Newton Chambers’s more indus­trial ori­gins. George Newton and Thomas Chambers were part­ners in the Phoenix Foundry, and along with fin­an­cier Henry Longden they signed an ini­tial 21-year lease in 1793 with Earl Fitzwilliam, the landowner, to extract coal and iron­stone from the Thorncliffe Valley. The com­pany would later expand into the pro­duc­tion of iron­ware, heavy machinery such as dragline excav­at­ors, and even mil­it­ary tanks. It was a hun­dred years after coal pro­duc­tion began that the trade name Izal was registered. It was, basic­ally, a hugely suc­cess­ful mar­ket­ing cam­paign — orches­trated by chief sales­man Joseph Godber, who was said to pos­sess ‘a mis­sion­ary zeal’ — to sell any product that could be made from or with car­bolic acid, a by-product of the Newton Chambers coking ovens at Rockingham Colliery, five miles away near Birdwell. The com­pany engaged an ana­lyt­ical chem­ist to explore the pos­sib­il­ity of using coal oil, which was claimed to have anti­sep­tic qual­it­ies but would not mix with water, and by adding emul­si­fi­ers they were able to dis­perse the oil. The res­ult­ing liquid was tri­alled in hos­pit­als across the land, and full page adverts were placed in pub­lic­a­tions such as The Times and London Illustrated News. Godber trav­elled as far afield as South Africa, Canada, the USA, India, the Far East and Egypt to pro­mote the products. W. Heath Robinson, the renowned car­toon­ist of the day who thought up laugh­ingly com­plic­ated machines for achiev­ing simple object­ives, was recruited in the 1920s and 1930s to draw a series of illus­tra­tions of vari­ous aspects of pro­duc­tion, in the form of posters and post­cards. The scratchy toilet paper, impreg­nated with Izal dis­in­fect­ant and every sheet prin­ted with the legend ‘Now wash your hands’ (not to men­tion, in some cases, ‘Property of British Railways’ if I remem­ber cor­rectly), was at first given away to local author­it­ies who bought bulk sup­plies of hygiene products, before being mar­keted as a com­mod­ity in its own right. Some of Izal’s health giving claims, and the dis­eases it would help pre­vent, might seem rather far fetched by today’s advert­ising stand­ards. Restrictions on the use of pois­ons, and increased com­pet­i­tion from more modern products, lessened Izal’s market dom­in­ance, although it was still a major profit maker for Newton Chambers until the 1970s. The com­pany, which had once employed 8,000 people, was sold off and split up, although the Izal fact­ory con­tin­ued to be run until 1981 by Sterling Health, who also bought the Ronseal DIY brand which still sur­vives at Chapeltown. 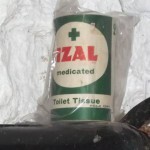 But in the end, pro­duc­tion of Izal med­ic­ated toilet paper at the North Sheffield fact­ory fell victim to the account­ants’ bottom line, as the bot­toms of Britain opted for some­thing a little more com­fort­able. Previous PostThe History of the Seaside Postcard — Malcolm Dolby — 29th February 2016.Next PostThe European Referendum-The Rt Hon Nick Clegg MP-14th March 2016.